What JotForm Triggers and Actions are Supported? New Submission - Triggers when a new submission has been added to a specific form. 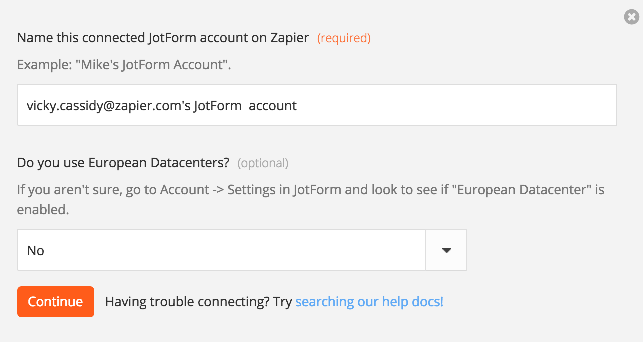 The first thing you'll need to do to get started with hooking up JotForm with Zapier and hundreds of other services is to add your JotForm Account to Zapier. Click to add a JotForm account in your Zap. 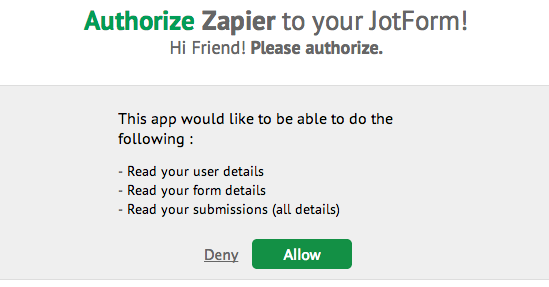 You should then get a pop-up window from JotForm asking you to log-in and allow the connection between that JotForm account and Zapier. After logging in and clicking the green button to allow the connection, you'll get sent back to your zap where you now have your JotForm account connected! If you reside outside of the US, try changing your settings to use the European Data Centers. You can do by re-connecting your Jotform account and selecting "Yes" to "Do You Use European Datacenters". This means that you aren't authorized to access the data and are likely not the owner of the form. You have to own the form to be able to access the data. You should be able to clone the form under your account and use that cloned version in your zap, or else have the person who originally created the form in Jotform connect their account to Zapier.